Winter is known for its long dark nights, is known for making us feel lazier, tired and sleepy, and there’s nothing more suitable for this season than a lighting upgrade. For that reason today we decided to give you some modern lighting designs that fit perfectly into any division of your house. Lighting makes such a difference in a room, high quality lighting will make other furniture stand out and liven up the whole space. Bright ambiances are more beautiful to the human eye and it makes its impact in our simple minds. That’s why interior designers tend to buy outstanding lighting designs that instantly transform the space, and, at the same time, enable the suitable brightness for the performance of everyday tasks. When talking about Ambient Lighting you can instantly think of fixtures, chandeliers and ceiling lamps. This type of lighting is supposed to reach almost every area of the room and that’s why they are placed in the ceiling. They also work as an important decorative piece, especially in living rooms and dining rooms. We believe this modern lighting designs displayed below are by far the most suitable and enable a dazzling look to any room. This lighting pendant is the perfect example for ambient lighting. Due to its classic, sophisticated design, its easy to blend this piece into any home decor. 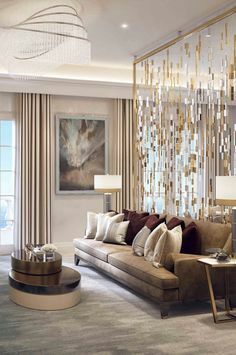 You can literally use this lighting design in any division of your house, because although it has very luxurious, classic look, its somehow very minimalist and modern. Metallic colors are always a great choice, and this is by far one of our favorite modern lighting designs. Scandinavian Design has been a huge trend lately, and we truly love it when it comes to lighting. This piece by Muuto has a minimal silhouette and industrial design and provides the highest quality illumination. You can use it alone or in group, it works perfectly either way! Task Lighting is all about desk lamps and floor lamps. This type of lighting is particularly made to provide the right amount of illumination that’s necessary to perform everyday tasks like, reading, eating, writing and so on. This one by DelightFull is a unique piece of design which combines luxurious ﬁnishes and exposed mechanical elements mixed with rhythm. Inspired by Michael Jackson’s iconic dance moves this lighting also provides an iconic element to any room. We love mid century modern lighting designs, they make any room look fun and creative without that much of effort. Retro lighting designs are usually pretty unique and extravagant. We love the combination of bold colors and bold shapes put together in a creative piece able to liven up any desk. This one is called Billy Table lamp and is also by DelightFull. Last but not least, accent lighting. Accent lighting is supposed to highlight objects like paintings, sculptures, photographs, anything you consider something to be on the spotlight in your home decor. For that reason it makes perfect sense that table lamps and wall lamps are the most suitable. If you’d like to highlight something, you need to have a simple, delicate wall lamp that doesn’t steal all the attention. This one is from our collections, it’s called Draycott Wall lamp, and its made in brass and crystal glass. A design, that besides its strong color remains exquisite and simple for any room. White is probably the most sophisticated color out there, and that’s why we believe it’s perfect to be used as accent lighting. Pieces like this one by DelightFull, will instantly provide a luxurious and dazzling look while working as a secondary decorative piece to complement your art. Hope you enjoyed these modern lighting designs. If you have any others you would like to share with us, let us know down below.